How to Get from Lisbon Airport to Porto City? If you need to travel to Porto from Lisbon airport or other part of Lisbon you have several options. Travelling by bus to Porto, this is the slowest option. Travelling by train to Porto, could be the faster option depending on the kind of train you pick. If you do not want to travel all day carrying your luggage, we provide you a direct and private transfer to Porto from Lisbon airport, hotel or other location in Lisbon area. Our prices are final and already include tolls. Select Porto City as your transfer destination area and provide us with flight details, Porto City accommodation address and contact. We automatically process your request for transport availability to Porto City and send a booking voucher with your transfer confirmation in a matter of seconds. At Lisbon Airport arrivals terminal a friendly driver will be waiting for you next to a placard with our website logo. For the return transfer we will pick you up from the same address in Porto City. And remember, you can always pay later to the driver for both your arrival and return Porto City transfer. How far is Porto City from Lisbon Airport? How much will it cost? How long? The travel distance between Lisbon Airport and Porto City is 310Km and transfer time takes approximatly 160mins under normal traffic conditions. We provide direct private Lisbon airport transfers to Porto. If you are a business person or just want to avoid all the hassle of catching buses and trains from Lisbon to Porto, we provide a comfortable door-to-door transportation service. Our fleet is composed by executive saloon or estate car for up to 4 passengers, a modern people carrier van or mini-bus up to 16 passengers or even a large bus up to 27 passengers. We practice cheaper prices compared to regular taxis and all prices already include tolls. Porto or Oporto in English is the second largest city in Portugal and is set along the Douro river. 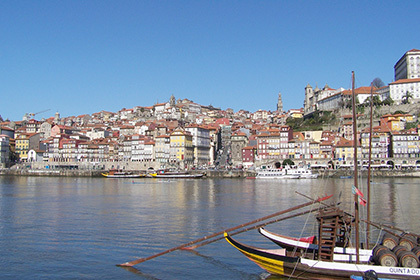 Porto is the most important city in the heavily industrialised Northwest Portugal. It was registered as a World Heritage Site by UNESCO in 1996. Porto exports one of Portugal internationally famous exports, the port wine. Our private transfer service will transport you directly from Lisbon to any hotel, company or private holiday villas / apartments in the Porto area. To pre-book taxi transfers from Lisbon Airport to Porto or to other near by destinations take a look at our full list of taxi transfers fares & prices.